This month marks the ninety-sixth birthday of Jack Kerouac (March 12). 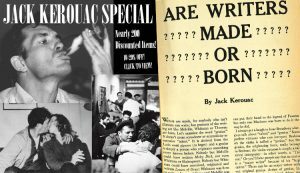 To us, Kerouac’s life and legacy are at once the most emblematic–and enigmatic–of the founding members of the Beat Generation. The man whose writings inspired his and subsequent generations all over the world to this day and beyond to break the bounds of convention, to travel and quest for “IT”–the answers to life’s essential questions–was at the same time a moody recluse tethered to his crude peasant mother. He and his Beat Generation were misunderstood and misappropriated–his designation as “King of the Beats” by the larger society they rebelled against was a crown of thorns to the haunted, Catholic Kerouac. As we all know, his was the shortest and most despairing life among the primary Beats. We can never know the full extent or all the aspects of his tortured sojourn. But read his many works of prose and poetry closely, and you will see through his eyes–and pen–the restless yearning for “IT” that could only come closest to being grabbed in the act of being chased after, like a pendulum swinging back and forth. In a memorable passage from On the Road, Paradise/Kerouac rushes toward a river–only to crash himself into a fence. We honor the great writer with a discounted sale highlighting virtually all the hundreds of his & related works we currently offer, from iconic most-sought-after productions to very scarce and obscure ephemera you won’t discover anywhere but here at Third Mind Books, your curated shrine to the Beat Generation and Beyond. 125 items (five times our “normal” featured amount)–all relating to Kerouac–from 10-20% off in March and April only!